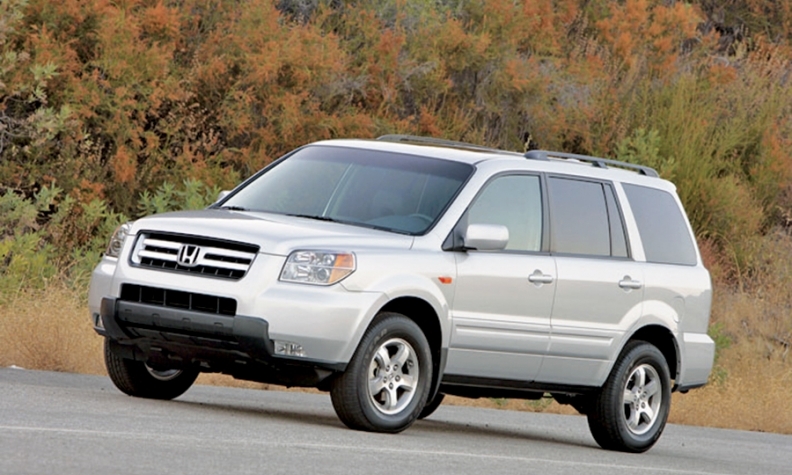 The 2008 Pilot is among the models added to Honda's recalls for Takata airbags. TOKYO -- Honda Motor Co. last week added more than 100,000 vehicles in the U.S. to existing recalls for flawed airbag inflators made by Takata Corp. The automaker discovered that it hadn't properly identified the vehicles as being produced for the market. The new recalls cover 104,871 units of the 2008 Honda Pilot SUV, 2001 Accord and 2004 Civic, according to a filing posted on the website of the National Highway Traffic Safety Administration. Honda's most recent recall comes after its U.S. advertising campaign on March 16 urged owners to replace potentially lethal airbag inflators immediately. The automaker is trying to ensure that car owners take action to prevent more fatalities and injuries after a rupturing inflator in a Honda car claimed a fifth U.S. victim in January. Takata inflators -- small canisters with gas-creating propellant that inflates the airbag -- can explode during deployment and shoot metal shards at passengers. The flaw that has led to millions of vehicle recalls by at least 10 automakers. About 25 million vehicles with Takata airbags have been recalled worldwide since 2008, Reuters has reported.